I almost never give color on a US Treasury TIPS auction but, today, I am. The Treasury just auctioned off 10-yr TIPS (Treasury Inflation Protected Securities) and the demand was robust... direct and indirect bidders took 89% of the auction, the most on record dating back to 2003. Bottom line: Protection from inflation was in high demand in today’s auction. 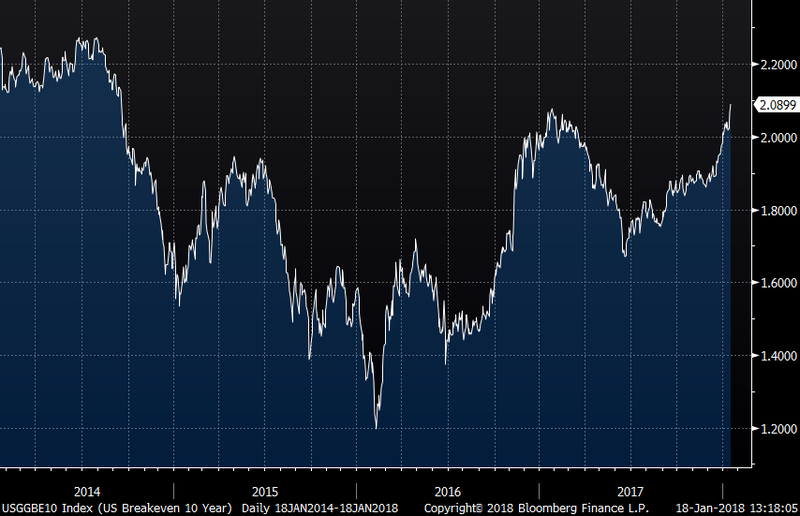 Implied inflation expectations have now broken out to the upside to 2.09%, the highest level since September 2014. Whether its wage fears or the rise in commodity prices, the inflation view is shifting and I repeat my belief that higher cyclical inflation in 2018 is a large underappreciated risk. The Fed meets in two weeks. I have to wonder whether this line will remain in the statement—one that has been in every single statement in 2017: “Market based measures of inflation compensation remain low.” Will they instead say it’s finally back to their 2% inflation target?